The interdisciplinary co-lab Biomimicry & Connectivity, held between the 10th and 12th of October in collaboration with Art Quarter Budapest resulted in a contribution to the field of Biomimicry: a publication - Biomimicry Budapest Perspective which we will realeas in March 2019. The publication Biomimicry Budapest Perspective is a compilation of written and art works representing the perspective developed during the co-lab. 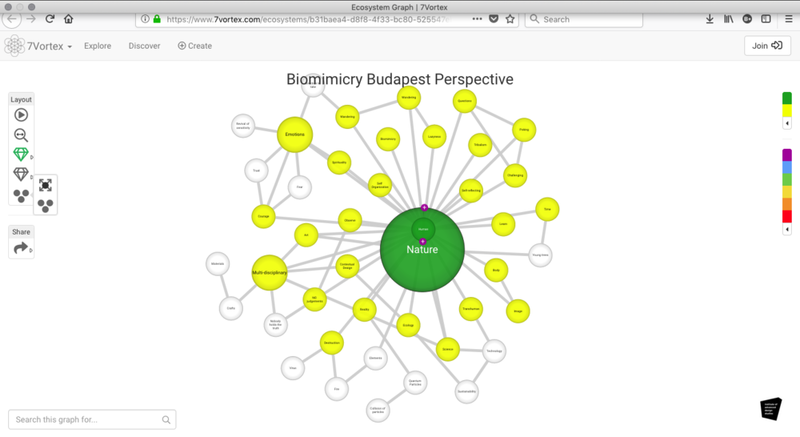 The Biomimicry Budapest Perspective is featured in the 7 vortex - everything is connected platform. The Biomimicry Budapest Perspective reflects on the quality of “what is human”. It concentrates on the meaning of “learning from nature” and the deeper aspects that connect human and nature. The Biomimicry Budapest perspective recognises the technocentric orientation of biomimicry practice. The practice is inspired by the shapes and functions present in nature, and some elements of the nature’s self organising principles. The co-lab team explores biological condition of a human, its advancements and limitations, comparable to an immature tree. The team looks at the collective intelligence evident in flora as well as fauna, and their self organisation capacities. There are many lessons yet to learn from nature, though perhaps the one we ought to learn first is about ourselves. Opening event - 9th October, 2018 the Institute was officially introduced to the public and media. The event was hosted by Ivan Bojar, the chief editor of epiteszforum.hu and it was held at the MEONIN Design studio. Biomimicry & Connectivity workshop - The Institute held its first event: an arts and design co-lab exploring the field of Biomimicry. The Co-lab took place between the 10th and 12th of October in the Art Quarter Budapest, the collaborative partners of the Institute. The event hosted speakers from arts, design and architecture backgounds from Hamburg and Berlin, Germany; Riga, Latvia; Amsterdam, the Netherlands and from Budapest, Hungary. The participants represented also varied backgrounds - artists, designers, architects, writers and biomimicry specilists from USA, Belgium, Singapore and Hungary. The Institute opening event at MEONIN Design Studio, Budapest Design Week 2018. Photos by Alexandra Heim. The Institute was represented at the Riga international biennial of contemporary art RIBOCA 2018, Riga, Latvia. The talk "Sustainability and Objects" was a dialogue between the Institute's founder Karina Vissonova Phd and permaculture designer and artist Claudiu Oprea (UK).